The VE248H by Asus mixes visual excitement with modern sophistication. Powered by LED backlight technology, the VE248H delivers sharp, true-to-life images with 2ms speedy response time and ASUS Smart Contrast Ratio that dynamically adjusts the display’s contrast ratio according to the image content, up to an astonishing 10,000,000:1. Full HD 1080p (1920x1080) support and HDMI port bring you into a spectacular world of colors, no matter what you are watching, thanks to Asus exclusive Splendid Video Intelligence Technology. For ease of use, the VE248H features convenient key controls for functional set-up in the multi-language OSD, and integrates hidden stereo speakers and cable manager for a clean look. Built with green in mind, the Asus VE248H still brings you stunning visual experience in a contemporary package. 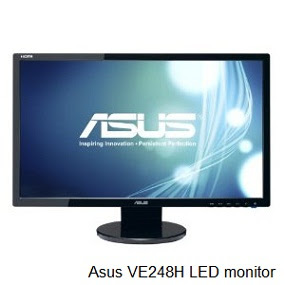 LED BACKLIGHT TECHNOLOGY - Featuring the LED backlight technology, the Asus VE248H provides increased brightness, enhanced color saturation with less power consumption, minimizes eye fatigue and is more eco-friendly to the environment containing no halogen, mercury or lead, compared with a typical CCFL backlight. ASUS SPLENDID VIDEO INTELLIGENCE TECHNOLOGY - The Asus exclusive Splendid Video Intelligence Technology employs a color engine to automatically optimize image quality with intelligent color, brightness, contrast and sharpness corrections for the best results in image preview, movie playback and gaming. 5 Splendid video preset modes via hotkey as well as 3 skin tone presets are available for optimal visual experience. FULL HD 1080P FORMAT SUPPORT WITH HDMI - With a native 1920x1080 resolution and widescreen (16:9) aspect ratio, the Asus VE248H displays full HD 1080p content in its native format without any loss of image quality. HDMI enables lossless transmission of high-definition digital video and audio through a single, convenient cable connection. FAST RESPONSE TIME - The Asus VE248H’s super-fast 2ms (GTG) response time ensures speedy color switching to eliminates ghosting and tracers for smooth motion video and gaming performance. ASCR (ASUS SMART CONTRAST RATIO) TECHNOLOGY - ASCR Technology automatically adjusts the luminance of the backlight for better displays according to the image contents, and improves the contrast ratio to 10,000,000:1 for more realistic depictions of night scenes during games or movies. 22.41" x 16.13" x 7.91"
Asus VE248H has lots of features to offer for the price of around 200$ and it definitely delivers for this price. It would be unfair to expect exceptional performance from Asus VE248H and you probably won't find many better FULL HD 24-inch LED monitors for 200$.